ABC decorations are so cool for the nursery or kids' rooms. An alphabet rug is a super way to get baby up close and personal with letters very early. Imagine your area rug as a crawling baby’s first book! That should be an inspiration to buy floor covering for the baby’s room that will be both decorative and educational. Parents are catching on to the fact that a child begins to learn from their surroundings. Decorations, bedding sets and accessories are being manufactured with designs covered in colorful letters with corresponding pictures. These images are used to increase baby’s exposure to the written word in hopes of insuring excellent reading skills farther down the road. Shopping for alphabet area rugs to blend with a particular nursery theme, color scheme or style of decor has never been easier. The recognition of the benefits has expanded the selection of alphabet rugs for the nursery considerably. Plain, block letters with no style have been replaced by fashionable colors and graphics that are the delight of decorator’s and children alike. Parents can pick and choose from any number of bedroom decorations based on an alphabetical theme as marketing trends move toward offering buyers entire collections rather than one or two pieces. The idea is to choose a set of alphabet baby bedding and then select the coordinating accessories that you need. Here is something that I find very exciting. You can have your favorite nursery themes (that have very little if anything to do with the letters of the alphabet) and find an ABC rug to match. That’s absolutely correct and a stroke of genius, in my humble opinion. For instance, if daddy is a airline pilot and wants his little boy’s room to be decorated with airplanes and flying memorabilia there are alphabet area rugs that are printed with letters of the alphabet and pictures of airplanes. 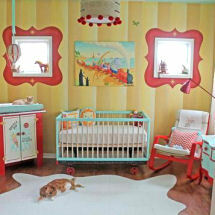 The same goes for many other popular nursery designs. You may find similar combinations of jungle animals, kids area rugs with a fancy, illuminated Beatrix Potter alphabet or even fairies with an elf or two sprinkled in the arrangement. The facts are that you can now have your alphabet nursery rugs without decorating the rest of the room in an ABC theme. This is indeed the best of both worlds as your child will become familiar with letters and you get to decorate the rest of the room however you please. Tradition tells us that a rug with the ABCs on it is baby stuff. But, here’s an idea for expanding the horizons of your older children. I recently heard of a mom who replaced the nursery rug with an area rug printed with the American sign language alphabet. Her daughter had a friend who was deaf and she thought this might help her to learn to sign. I found this idea inspiring and I had to admire her creativity and imagination. It also made me wonder where I could find an Alphabet rug with Chinese characters for an oriental room! Return to Unique Baby Gear Ideas to find more alphabet baby nursery ideas and tips on how to find the best kids' area rug for your nursery decorating project.